A few weeks ago HTC held a small press conference and announced the new HTC Nexus 9. 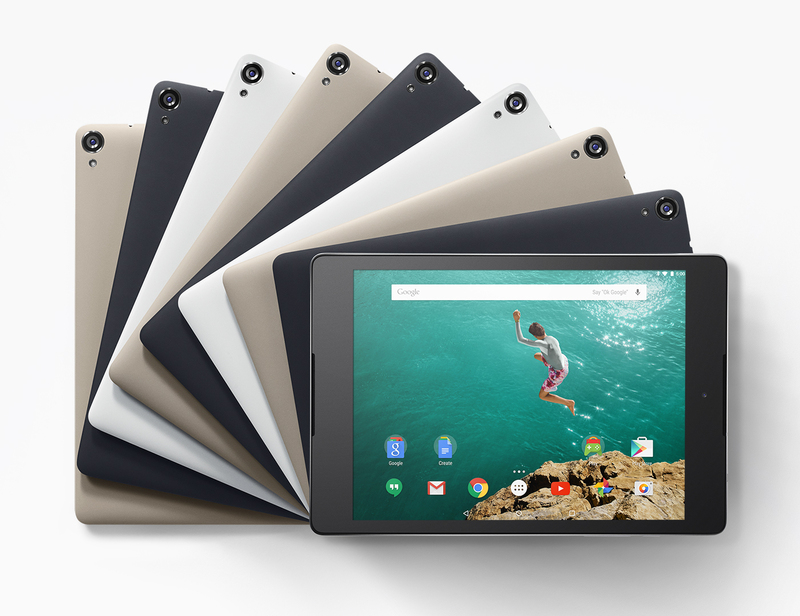 The Nexus 9 is one of the first devices featuring the latest Android 5.0 Lillipop. This new OS version breathes new life in to Android and unusually for HTC, the Nexus 9 has no HTC Sense overlay so there is a nice clean feel to the UI. It has been quite some time since HTC produced a tablet and we have high hopes for the Nexus 9. In the video below we start with a short unboxing and then go hands-on with the hardware and a look at the OS and UI. The HTC Nexus 9 is available now from Currys. Our thanks to them for the for the review device! Primary camera: 8 MP, 3264 x 2448 pixels, autofocus, LED flash, Geo-tagging, touch focus, face detection, [email protected], stereo sound rec. Quite some time ago I decided to get myself a stylus for my iPad as I wanted to hand right notes. At the time I chose the Adonit Jot Flip. Things have moved a long quite a bit and the folks at Adonit have just released their latest incarnation, the Adonit Jot Touch. 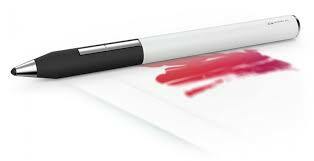 Boasting features such as 2048 pressure levels and feature buttons that allow access to menus or other items the Jot Touch has a Pixelpoint™ fine point stylus. Jot Touch with Pixelpoint™ works seamlessly with tons of your favorite digital creation apps. Connect it to a Jot-Ready App to take advantage of features like palm-rejection, pressure sensitivity and shortcut buttons. Which means that we’ll see Lollipop on the M7 and M8 by the beginning of February 2015. This will be deployed as an over the air update starting with SIM free devices first. No precise details on the deployment to various carriers and how long we’ll have to wait here in the UK as yet but it’s certainly a step in the right direction! Just last week Royal Caribbean International took delivery of their newest cruise ship, Quantum of the Seas, from Meyer Werft Yard. But Quantum of the Seas is all about technology and is the most technologically advanced cruise ship in the world, Royal Caribbean say it’s the world’s first Smart Ship, with “boatloads of bandwidth” which allow the cruise line to offer unprecedented connectivity – 500 times more than any other cruise ship; easy-to-use systems that expand guest choices and simplify schedules, plus, RFID technology that speeds up the boarding process and allows guest to track their luggage every step of the way. Tracy and I were able to spend two nights on Quantum, to experience all of this technology for ourselves. This equated to two days of liberally using words like ‘Awesome’, ‘Amazing’, ‘Incredible’ and ‘Brilliant’. About 10 days before we were due to set sail, Royal Caribbean sent me my “reservation number” and asked if we would complete the online check in. This process is very similar to online check in for an airline where they go through and take all your relevant information including passport and visa details. Although, as we were going on a cruise-to-nowhere, a visa was not required. During the process you are also asked to take or provide a headshot which is then used as part of the boarding process. If you were going on a cruise which stopped at other ports the photo is used to identify you when you leave and board the ship as they scan you in and out with your WOWband or smart card. If you are not happy providing your own photo they can also take one at the port as part of the check in process. The last part of the online check in was to set up your onboard charging account. Once you have this set up it means that once onboard just a quick scan of your band and you can pay for anything! The other big part of the pre-planning Royal Caribbean have introduced comes from their change from a traditional main dining room to their new ‘dynamic dining’ system. Once I was checked in I could then go and make restaurant reservations for our 2 nights along with entertainment reservations for the shows. The system will also handle the shore excursions and spa appointments in the future. What’s really nice is once you have something booked it tells you if you are going to have a clash and you can view everything in the really well laid out planner. Once onboard all these reservations will then transfer to your Royal iQ app and will also save guests from standing in lines and trudging from place to place on the first day of the cruise. As Royal Caribbean say, ‘you get the first day of your vacation back’. Royal Caribbean guests can go from “sidewalk to ship” in 10 minutes with no check-in counter, no forms to fill out and no lines to stand in. The average check in time on the day we boarded was just 7 minutes! 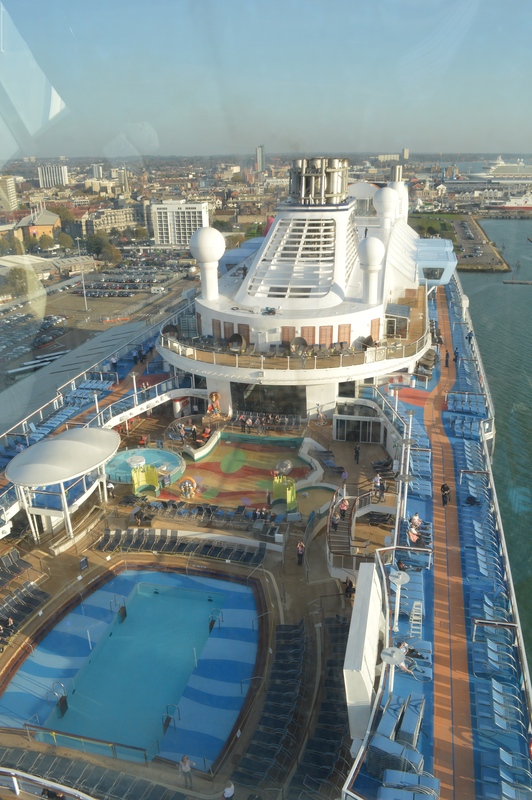 RFID technology is becoming more commonplace and Royal Caribbean are certainly using this to its advantage in a number of key ways. During the boarding process, RFID tags are placed upon your luggage. This allows guests to track their luggage in real time on their smartphones and monitor their bags’ progress through key points en route to the stateroom. On departure, the process is reversed. 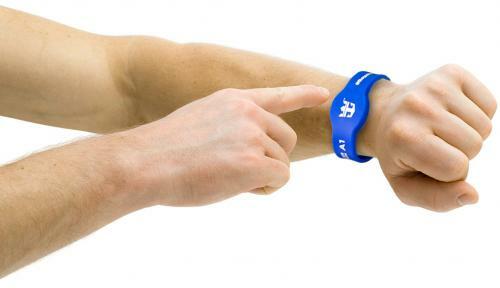 Quantum of the Seas also has new RFID ‘WOWband’ wristbands, which can be used as your room key or can be used to pay for onboard purchases, make reservations, find your photos in the onboard photo shop etc. Simplicity and efficiency are also at the heart of two new apps that put guests in charge of their cruise choices: Cruise Planner, which allows guests to research and book dining reservations, shore excursions, spa appointments and more before their vacation begins; and Royal iQ, available as a downloadable app and provided at freestanding iQ stations around the ship. Royal iQ allows guests to manage details during the cruise, includes a convenient calendar that provides at-a-glance views of their program, and keep in touch with one another and home via phone and text capabilities. Connectivity on cruise ships has always been hit or miss and bandwidth is a big issue. 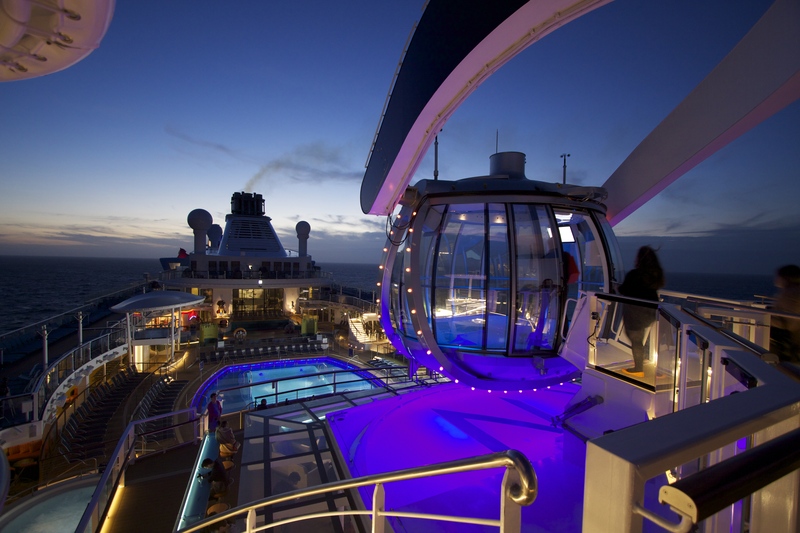 This is set to change with Quantum of the Seas though, as Royal Caribbean International teamed up with O3b Networks, a global satellite provider, who developed a new technology. 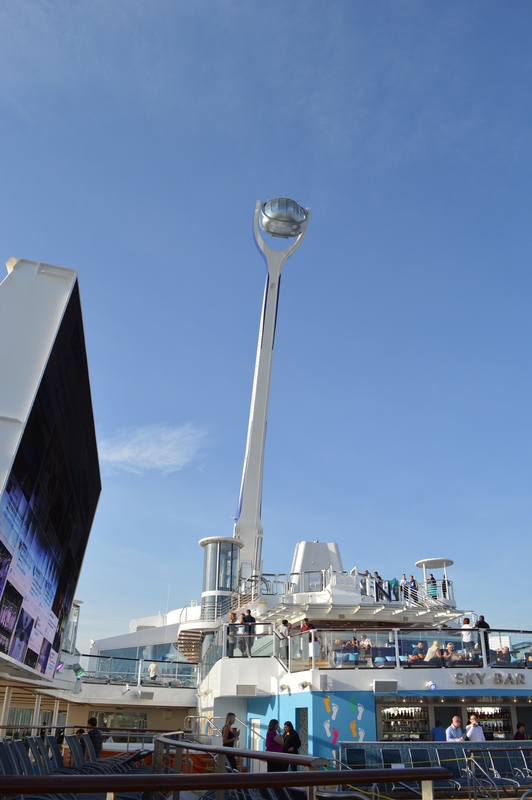 This new satellite network delivers “fiber-optic bandwidth.” Quantum of the Seas features O3b fiber-like Internet service which will provide more than 500 times the bandwidth that you’d experience from a regular on-board connection. The O3b fiber-like Internet service was first piloted on Oasis of the Seas in December 2013 and has also been since introduced on Allure of the Seas. The new system fitted to Quantum of the Seas will provide O3b coverage as the ship approaches the east coast of the United States. 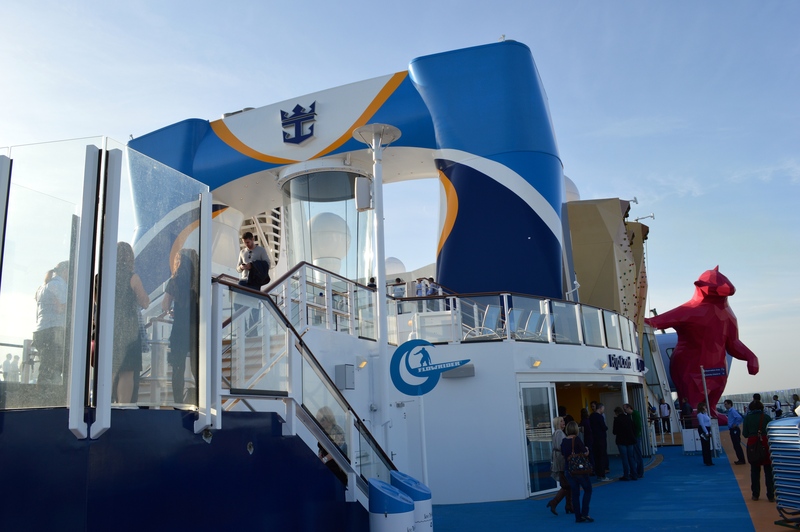 Royal Caribbean International is now testing a variety of pricing. While the prices are highly subject to change, the current pricing offers guests $29.95 per hour, $99.95 per day, and $189.95 for unlimited usage on a 7-night cruise for one device. You may read elsewhere in the press that there was ‘no Wifi coverage’ on Quantum during the inaugural sailing but that’s just sensationalism. There was indeed WiFi on board but there isn’t O3b satellite coverage in Europe as yet. 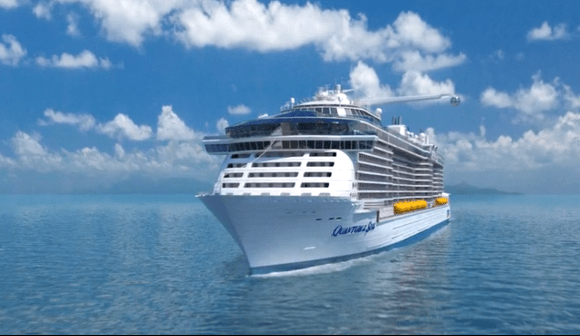 This will be ready in time for the launch of the next Quantum Class ship, Anthem of the Seas, when she commences service from Southampton in April of 2015. A fact that was made clear to members of the press both before and during the inaugural sailing. Ripcord by iFly is just awesome! This offers guest the chance to experience skydiving in a wind tunnel and is the first of such to be installed on sea-going vessel. Following a short briefing video and time with an instructor, guests are provided with a jumpsuit, goggles, helmet and ear protection. Your group is then taken to the wind tunnel where you get to take it in turns to experience what it’s like to freefall skydive. With a series of hand gestures and physical guidance from an instructor it doesn’t take too long to get the hang of the basic positions but it looks like a lot of training would be needed to get really good at it. Fortunately, you’ll be able to buy packages to give you a certain number of training sessions with an expert. I’d recommend keeping each session fairly short to begin with though, it takes a lot out of you! 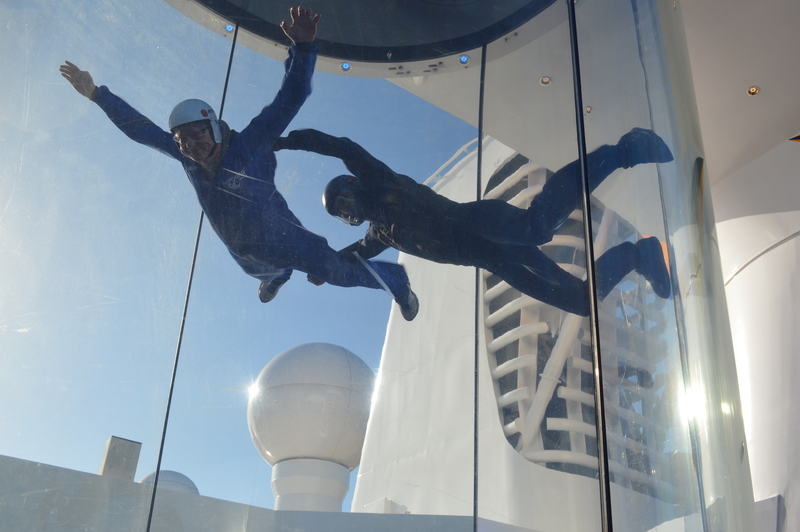 If skydiving seems a little bit too energetic for you then there’s another way to experience some sights aboard Quantum of the Seas with North Star. North Star is “an engineering marvel that transports guests more than 300 feet above the ocean”. 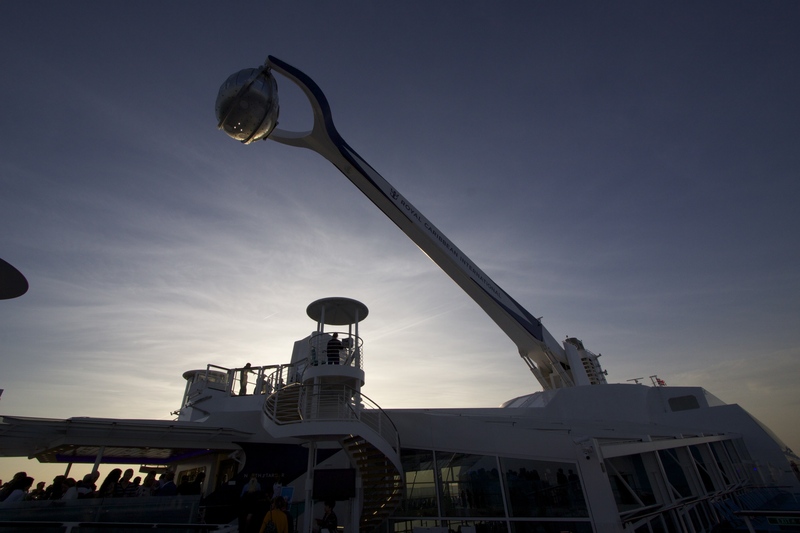 Guests board a large glass capsule at the end of a large boom arm and are then hoisted high in to the air for unique views of both the ocean and the ship itself. Here you can take some exceptional photographs and I’m sure it will be even more amazing to be able to take photos of some of the cruise destinations and North Star is able to operate both at sea and in port. So heights may not be your thing but if you’re still looking for some fun then there’s plenty to be had at Sea Plex. 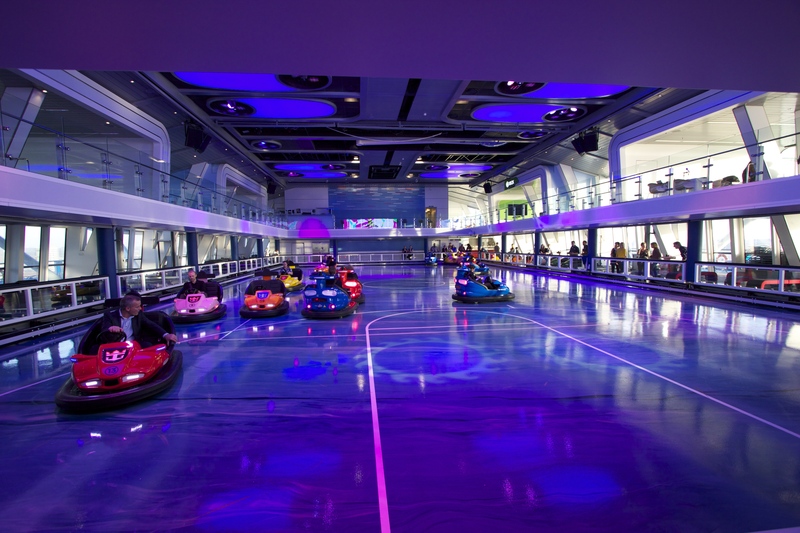 Sea Plex offers the largest indoor active space at sea and is a distinctive and flexible sporting and entertainment venue offering more first at sea experiences, guests can experience a circus school with flying trapeze, or play basketball on a full-size regulation basketball court. 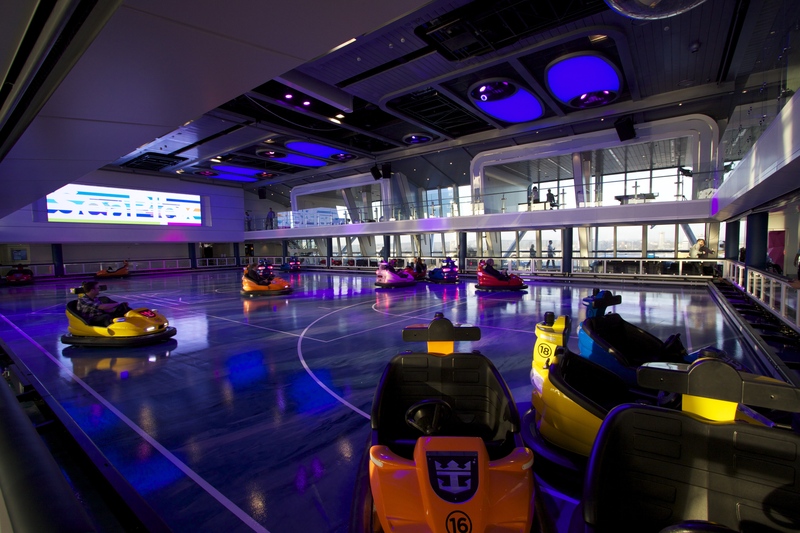 By night, the first-ever bumper car and roller skating offerings deliver fun and excitement. 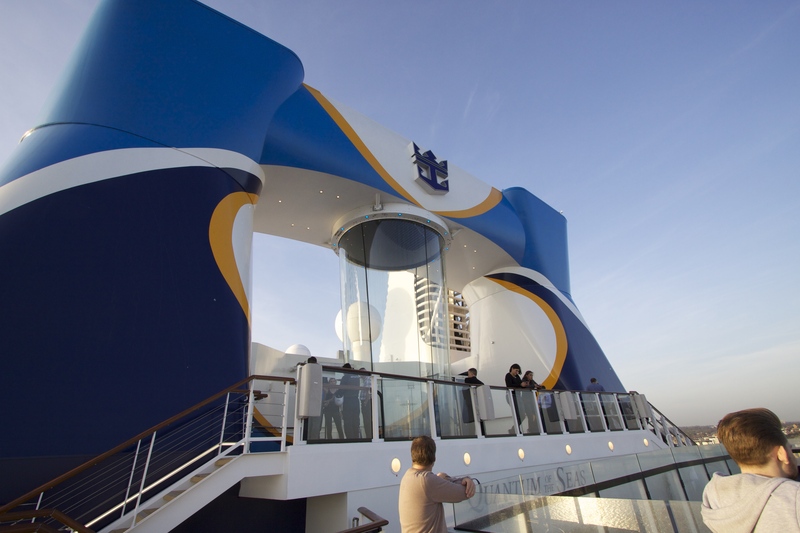 Or, guests can dance to music orchestrated from a floating DJ booth which hovers above the activity below. 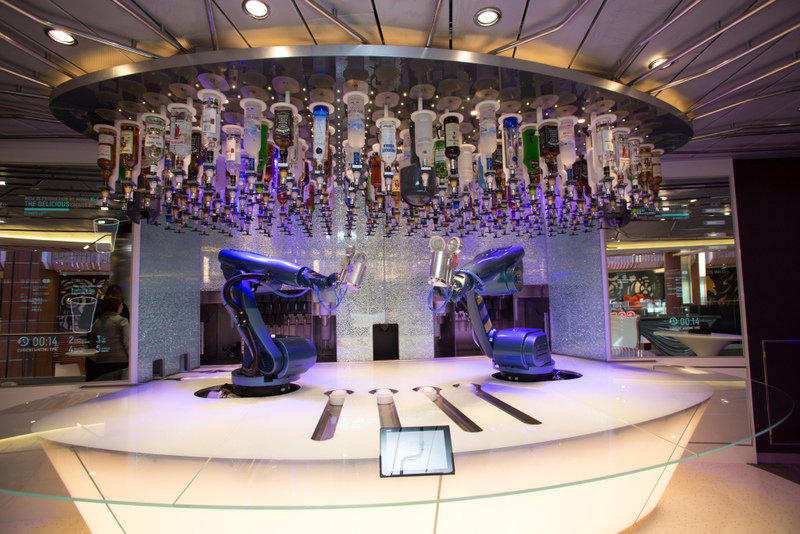 One of the coolest additions to Quantum of the Seas are the robot bartenders at the Bionic Bar. These masterpieces of technology can create and pour your favorite mixed drink in just a few seconds right before your eyes. Tablet computers allow patrons to select their desired drink for an extensive list while electronic screens at either side tell you how long you’ll have to wait for your drink and where you are in the queue. Unfortunately the Bionic Bar was plagued with teething problems during our time on Quantum of the Seas but we were able to see it operational on a number of occasions and it certainly is a talking point. It also ensures that you get your turn to order from the bar fairly and the robots don’t ask for tips! Tracy and I were lucky enough to see much of what goes on behind the scenes on Quantum of the Seas and spent some time with Captain Patrik Dahlgran, Capt. (Felix) Srecko Ban, Captain Gus Andersson and Richard Pruitt (Vice President of Safety and Environmental Stewardship). But that’s all for another post!